Monday August 23rd 1909 The Ringling show was in Centralia today. We went up to see the parade which was fine and after an early dinner went to the grounds which was quite a distance from the house. Scott Lizzie and I went together. It was very nice. In the evening I went with Lizzie & Effie to a small theater up in town. A pretty full day. 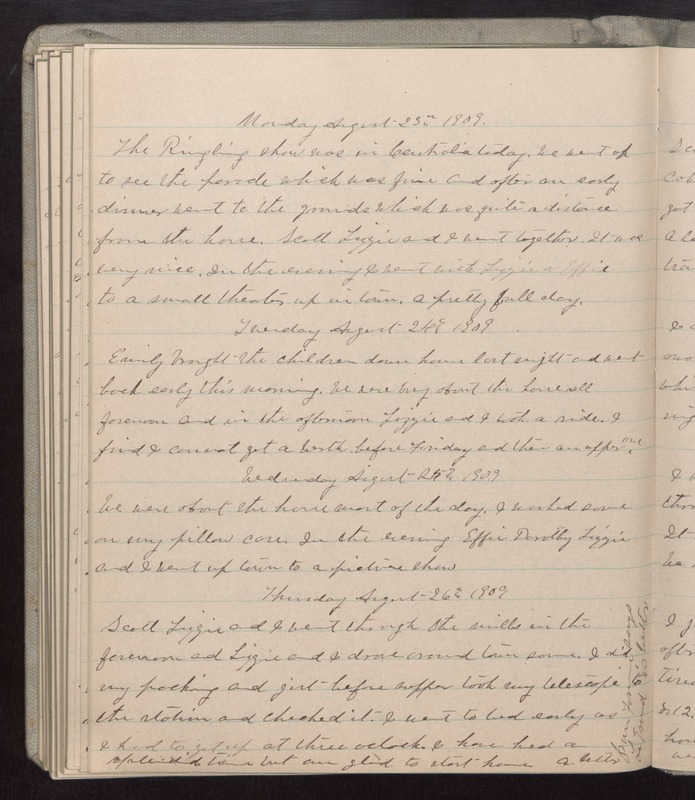 Tuesday August 24th 1909 Emily brought the children down home last night and went back early this morning. we were busy about the house all forenoon and in the afternoon Lizzie and I took a ride. I find I cannot get a berth before Friday and then an upper one. Wednesday August 25th 1909 We were about the house most of the day. I worked some on my pillow case. In the evening Effie Dorothy Lizzie and I went up town to a picture show. Thursday August 26th 1909 Scott Lizzie and I went through the mills in the forenoon and Lizzie and I drove around town some. I did my packing and just before supper took my telescope to the station and checked it. I went to bed early as I had to get up at three oclock. I have had a splendid time buy am glad to start home a letter from Fannie says Le [Grand?] is better.